Did anyone else see this on their FB feed? Slightly different that the tweet that went out around the same time. This seemed like more of a “please send David mail, stat!” message. Or maybe that’s just me. It got me thinking though. Thinking about what it must feel like for David knowing that in less than six months you’ll be home. Wondering how many fans are actually left. Wrestling with decisions about what to do next. Maybe seeing your mail dwindling to a few lonely postcards. As much as I’d love to, I can’t find an ace mentor for him or line up a label or bankroll his next recording. Heck, I’m not even qualified to cut his hair. But I can grab a pen and some paper and splash out for a stamp. Even if I just say “Still here, D. ~ Hasta luego… à bientôt.” That much I can do. I think this is a very important time to stay in touch with David. The time is winding down on his mission and I’m certain he’s trying to figure out what his next move should be. 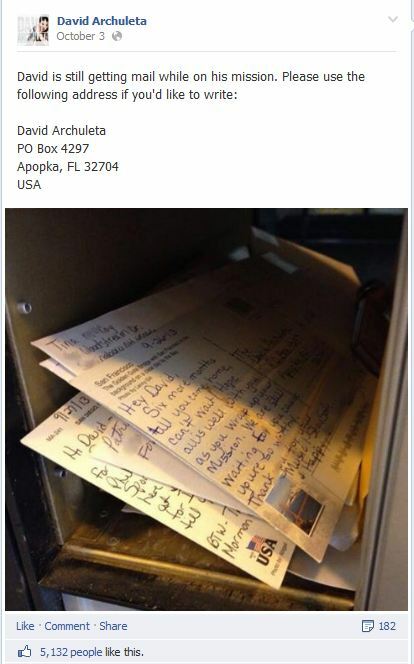 The only real barometer he has for how many fans are still supporting him is his fan mail. “If” he is at all insecure about that, any kind of a greeting would go a long way in letting him know that he still has a fanbase to come home to and it could very possibly effect his career decisions. I send something every month. Most recently I saw the cutest card with a picture of a squirrel and sent it on behalf of Almond and New York. (Memory type things) Sometimes it’s a Postcard from Iowa or wherever I travel. Most messages are brief Greetings and yes that we are here. …AND WILL BE!! DIDN’T EVEN THINK THE Message was a hint but what do I know!! oops Didn’t mean to Yell!! For some reason this post doesn’t show up when I just go to the main page but it does when I click on the direct link from your tweet? LOL so mysterious. Anyway. I must admit that I had not sent David any mail at all since he left until about a month ago. I wasn’t sure what to say (because I’m HORRIBLE at talking to him lol) and I felt like he probably wanted to focus on the mission? So I felt awkward about being all, hey David think about me for a while! ha. But finally I decided I needed to send something just to say I’m still here so I did. And, as expected, I was awkward. Good times. I have mentioned before that I send one small and cheesy homemade postcard every month, with a very short supportive message. Obviously, I’m not the only one sending messages—hooray for the rest of you! And I am convinced it is a good thing to do. Temporarily awkward or not, he will be the same singularly talented (and handsome) David we love; but we will see added maturity, honed leadership skills, and more confidence. When all that merges with his return to music—BAM! We’d best be ready. I looked at the messages on FB and twitter. Kari’s tweet assumed you knew the address (or knew that it’s on the OS) but I couldn’t find his fan mail address anywhere on his Facebook! So maybe that’s why the tone is different? It sounds very matter of fact, not desperate to me. It would be cool if it got David a few extra cards from around the world! I have several unsent postcards, including a “bigfoot” one I found on our recent trip to the Olympic Penninsula. Didn’t he say he liked cryptozoology at one point? Or should I send the banana slug because how random is that? That top postcard in the pic from Kari is from me. I try to send D one each month to let him know that we miss him and can’t wait for him to come home. I don’t post much on these websites, but I am on twitter for trending, etc. Any way to show support is all good, I’m sure he likes to get mail from fans. Don’t know if you are over reacting TOfan about the mail or not but certainly is a nice and loyal gesture to send off a note to Dear David. Oh and that sidebar pic up top with that caption….LOL. Thanks for the laugh! Like peppertara, I’ve sent some postcards and a few cards, but not every month. I keep thinking about the small amount of time he has to himself and wonder how he gets all his mail read, but I also know it’s important that he knows we are here and very much looking forward to his return. I’ll probably start sending something every month now until he returns home, or at least through February. Not sure if he would get anything after that until he is home because of the time it takes to get a package to him, but that would be okay too! BellaGoGetter, how fun to see the card you sent in that picture! We interrupt regularly scheduled programming so I can FREEEEEEAAAAAAKKKK OUUUTTTT!!!!!! @Meganloves2lol tour dates???? some performance/appearance dates maybe?